Is It Time You Got A Reception Desk For Your Office Lounge? 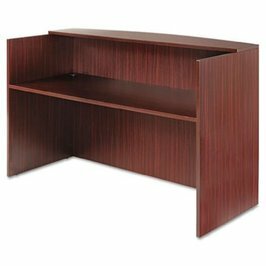 Reception desk furniture is primarily what your clients and guests will notice when they walk into your office. Before their eyes are bedazzled with the plush interiors of your lounge, they would take one look at your reception desk and the ones who have an eye for detail, will have a fair idea of how you conduct business. It is not for nothing that most business owners spend a fortune trying to keep up the appearances in the lounge or reception area. If you have recently launched your line of services or have been in the field for a while, you could be looking for that one reception desk to make a difference to your brand name. Find the top 8 reception desks reviewed here along with what users have had to say about them. This could very well be the gateway to your final decision. 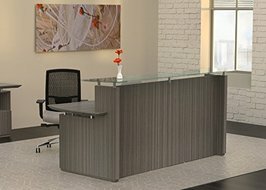 What do you need to consider while choosing the reception desk dimensions? A reception desk is a major investment and it is important to consider the space you need it to fit into before buying the product. There are a few necessary steps that will ensure you are on the right track. The primary factor while considering your reception desk dimensions is the foot traffic and whether it will easily flow through after placing the desk in the room. Find out if there is enough space for people to move around freely so that they don’t end up bumping into each other. The last thing you would want is to send the desk back after it arrives, simply because you missed measuring the surroundings too. How would you choose the best office reception desk chairs? While choosing office reception desk chairs, you will need to keep in mind comfort because that is directly linked to better habits. The four factors you need to consider are comfort, mobility, durability and adjustability. High back vinyl office chairs are what you should ideally aim for. High back reception desk chairs offer much-needed support the entire back and prevent long term strains. Vinyl office chairs are easier to care for, require low maintenance and are mostly compatible with all kinds of office décor. The number of office reception desk chairs depends on the type of reception desk you have. Most offices prefer a dual seating arrangement for the best working conditions. How will you ensure that you are investing in the right kind of reception desk furniture? The first impression of your work space is denoted by the reception area and you wouldn’t want to compromise one bit on this aspect. You will need to begin by paying attention to the choice of colors. Colors can make or mar impressions and it can be a tedious task to choose the best. Neutral colors work wonders and create the impression of space. The reception desk should be in sync with your office environment and the foot traffic should be primarily considered while investing in a reception desk. Your reception area should have elegant looking storage systems. This is meant to display magazines, brochures and also to give a neat and organized look to your reception. Wall paintings and décor will contribute to making the space in your office brighter and more inviting. You can choose general paintings or things that are directly related to your business structure. You can also choose famous sayings that hold attention. However, whatever you choose to do, always remember to keep the space uncluttered. What should the reception desk height ideally be? While considering the reception desk height, always keep in mind ergonomics because people are expected to spend longer stretches of time at it. The ideal reception desk height should be between 110 to 115 cm so that it is convenient and comfortable for everyone. What are the recommended reception desk materials? 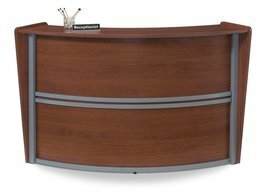 Reception desk materials range from laminate to wood veneer to solid wood. Laminate is the most inexpensive choice and is ideal for you if you are on a budget. It can be customized to look like real wood and can also be seen in solid colors. The best part about laminate is that it is highly durable, scratch proof, stain resistant and requires low maintenance. Wood veneer is similar to plastic laminate but is made of real wood. It looks classy and sophisticated because it gives you the look of real wood. There are different types available and in different colors that range from simple to exotic. The most luxurious option is that of solid wood. If you want your office to look absolutely upscale, there is no better option than this even if it does get heavier, it will last more than a lifetime. Does your office really need a reception desk with storage? Reception desk with storage is the latest trend in office furniture and the biggest reason is the need to save as much space as you can. Offices these days are mostly cramped and overcrowded to begin with. Reception desks with storage give you the option of keeping your office accessories and important documents in one place without cluttering your desktop. Consider desks with open book shelves, cabinets and closed cubicles to store all documents safely. 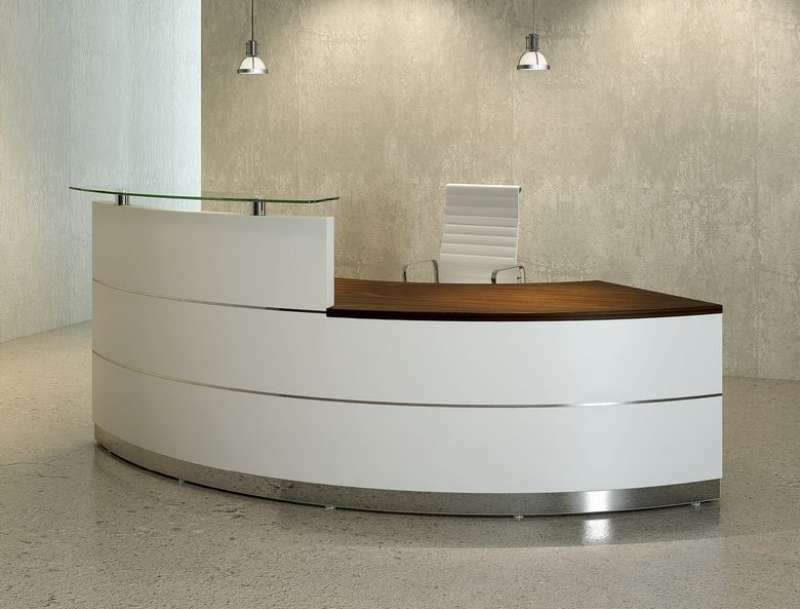 What reception desk shape should you opt for? L, U, curved and linear are the commonest reception desk shapes these days. An L shaped reception desk can save a lot of space and fit into any cramped office without overcrowding it further. It even gives the visitor an illusion of space. 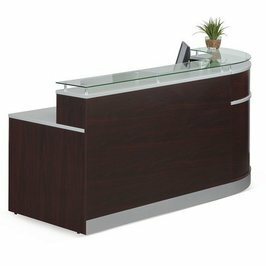 L and U shaped reception desks are being mostly used by business owners today because of the versatility and functionality of the shapes. The ALEVA327236MY – Best Valencia Series Reception Desk w/Counter is msostly used for commercial purposes, this reception desk is designed to last long and make a beautiful first impression for your guests. Among all kinds of office furniture, reception desk is what makes a difference to the brand name of your company because it is the first official meeting point of your client and your company. This stunning yet highly functional piece of office furniture has a laminate work surface. It features water, stain and scratch resistant side panels. The reception desk ensures that your privacy is maintained at all times with the help of a bow-shaped transaction counter and high-sided panels. An edge banding of 3mm keeps it well-protected from bumps. You must have seen how often desks and chairs keep wobbling on uneven floors but the leveling glides that come along with this desk prevent instability. Scratch-resistant side panels make it durable. Leveling glides help stabilize the desk on uneven surfaces. Assembly could be an issue if the reception desk comes in parts. The product dimensions are 36 x 72 x 43 inches. Users are quite happy with the product and consider this reception desk great value for money. They are highly impressed with the durability and sturdiness of the product and the way it withstands the test of time. The Reception Furniture Single Unit Curved Station is an excellent choice. Whoever said that office reception desk needs to be expensive did not know about the OFM Marque Series Single-unit curved reception station. 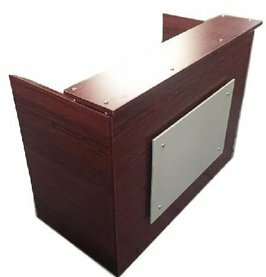 Priced competitively in comparison to other office reception desks available in the market, this piece of furniture has a highly durable construction and is made to last long. It will be a huge budget-saver and its lifetime warranty is an added bonus that will compel you to consider this choice. The interior desk has wire management cutouts to keep cord clutter at bay. No tools are required to assemble this reception desk. Perfectly suitable for those on a budget. The option of adding wheels to the bottom of the reception desk has not been provided. The Altra Dakota L-Shaped Desk with Bookshelves ensures that you have plenty of space for all your office essentials and are yet far from overcrowding the area. This reception desk will fit into your office corner perfectly will also help maximize your area by offering you the option of stacking books on the 2 open bookshelves. The desktop of the table is spacious enough to hold your laptop or your PC along with their office accessories. There is also enough scope to place your binders, books and official papers on the shelves without cluttering the desktop. Hardly takes up much space due to the intelligent design. 2 open bookshelves help stack important books and documents neatly. Desktop is large enough to hold monitor or laptop. Features 2 grommets to keep cord clutter away. The edges of the reception desk are sharp. The desk space is narrower than expected. The product dimensions are 53.6 x 51.3 x 28.3 inches. Most users are highly satisfied with the pricing of the product and also with the easy assembly. They feel that the L-shaped design allows efficient multi-tasking and saves a good deal of office space. Were you looking for a 2 person reception desk? Try this one! Ever thought of making a stunning first impression? The NBF signature series Esquire collection has a 2 person reception desk that spells sophistication from all sides. With floating glass, silver accents and a rich laminate top, this piece of furniture is not only pleasing to the eyes but also highly functional in nature. 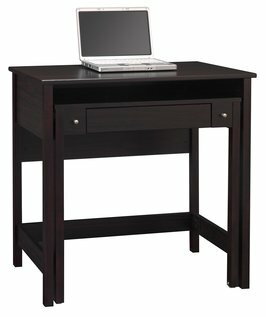 With scratch, stain and spill resistance at work, this desk ensures durability and sturdiness. The best feature of this desk is the tempered glass top that looks like it floats on the surface. Users feel that the tempered glass is a classy addition to this series of reception desks and makes all the difference to it. The sturdiness of the desk adds to its popularity and the scratch resistance makes old users recommend it time and again. Wire management grommets keep the desk space uncluttered and organized. Scratch, spill and stain resistance keeps the laminate surface in optimal condition. The tempered glass top adds sophistication to its simplistic design. It requires assembly that might take up some time. The product dimensions are 95”W x 64”D. 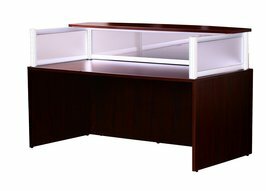 The Boss Plexiglass Reception Desk, Mahogany is a great pick for your reception area. This mahogany finished unit can be used by itself or along with other reception items and it is bound to make a tremendous first impression for your guests and clients alike. The Plexiglass adds a touch of uniqueness to this desk and the mahogany finish makes it look sophisticated and elegant. This is undoubtedly a must-have if you plan to impress your guests instantly. The desk shell can be used by itself or with other items of reception. A lot of guesswork goes into the assembly of the product. The product dimensions are 42 x 30 x 71 inches. Most users agree that there is a good deal of benefit owing to the fact that the desk can be used separately or with other reception items. However, a lot of users have found the assembly quite tiresome and time-consuming. 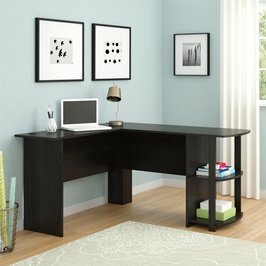 Have you been eyeing a modern and sleek look for your desk reception? Office Pope’s modern reception desk is all that you need and more. With a high-tech look and a finish that spells grandeur from all sides, this reception desk comes in three unique and textured color tones. These are textured brown sugar, textured mocha and textured driftwood finish. What’s more, there are optional file cabinets and matching store cabinets that come along with this modern reception desk. The frosted glass counter top is thick and highly durable. The wide range of options that this reception desk offers is what users like the most about it. The thickness of the table top is perfectly balanced with the sleekness in appearance. The five year warranty is like icing on the cake. Hand-crafted table top is sturdy and durable. Instantly gives your reception area a high-tech look. Comes with a warranty of 5 years. The pricing might be on the higher side for people who are on a tight budget. The product dimensions are 72 x 48 x 43 inches. A small office needs an office reception desk – small to save space. Try the Bush Furniture brandy wine collection. Bush Furniture has come along with an intelligently designed office reception desk-small yet highly functional. This particular desk offers you the option of using two desk surfaces in one. This is highly beneficial because you can use the secondary desk surface when you need to and stow it away when you are done. This results in major space saving. There is an open area between the primary and the secondary desk surfaces where you can keep your laptop. The design is simple and attractive. Offers the benefit of using both the primary and the secondary desk surfaces. Space between desk surfaces can be used wisely. Might not be as sturdy as its other counterparts. The product dimensions are 20 x 35 x 33.5 inches. Who doesn’t love saving space and with this incredibly designed reception desk you can do that and more. Users love the dual work surface option that comes along in a single package and the way the retractable desk and drawer are kept elegantly discreet. Looking for reception desks standing models? The DFS reception desk shell is your best bet! Reception desks standing models are best suited for business offices that welcome guests every often. The reception desk shell from DFS might be exactly what you are looking for. The work surface is made of commercial grade laminate and the side panels are scratch proof as well stain proof. The front accent in espresso and white is perfect for your company logo. It has been designed exclusively to save a great deal of space in your office. A grommet hole for wire management keeps your desk space clutter-free. No negative reviews reported yet for this reception desk. There is no denying the fact that the reception desk is the backbone of your lounge area because that is the meeting point of most of your business prospects. You would always want the reception desk to be flattering and inviting. A lot of people prefer highlighting the company’s brand name on a reception desk but what is most important is to invest time in the choice. Consider your office space, the décor, the interiors and the colors and choose a desk that is compatible with all these factors. This article aims to help you with the essential factors you need to consider before making a choice and the best options available to choose from.